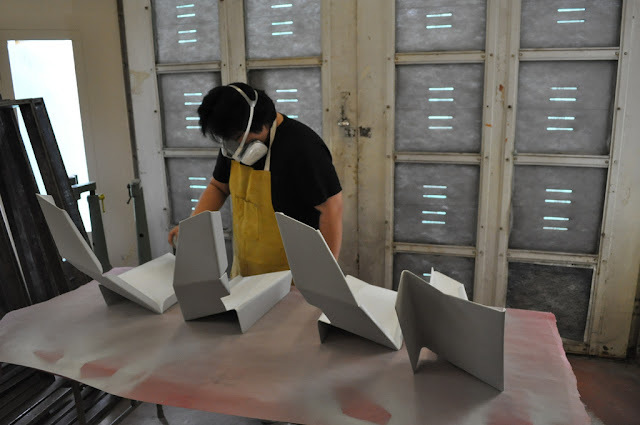 After the splitting of the Formula Fiberglass negative mold, positive gel coat molds are formed using a multi-coating process. First, a degreasing compound is applied in addition to a wax coat. 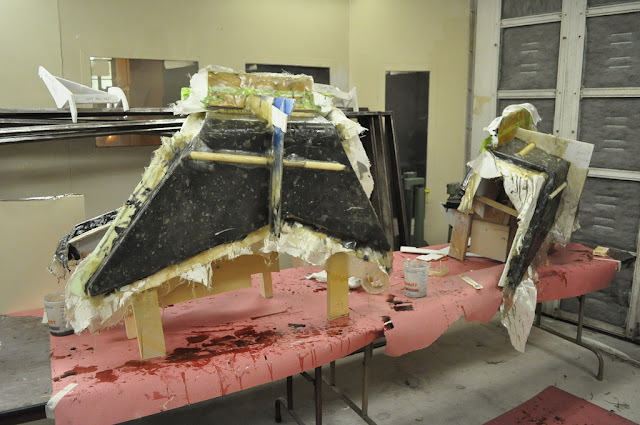 The Formula designers then apply a black gel coat, which is premixed with a hardener in order for the positive gel-coat layer to cure. 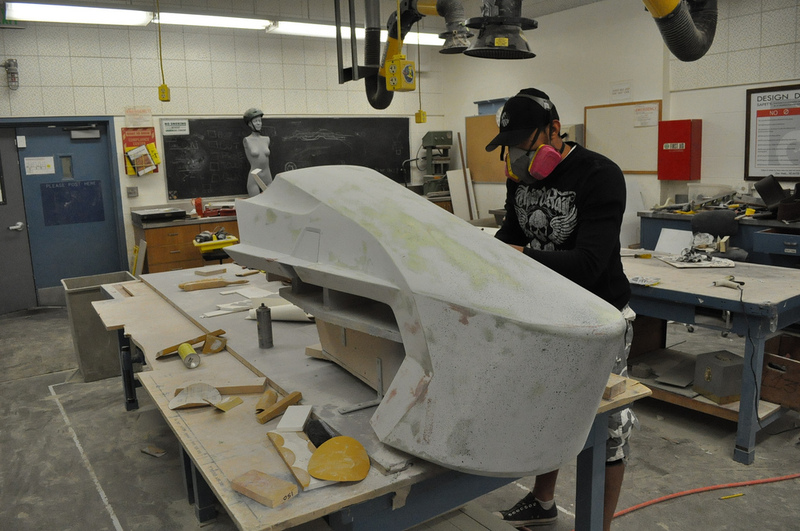 Much progress has been made with the fabrication of the Baja racer. Most of the side panels and vacuum formed parts for the front portion are completed. In addition to these panels, duplicates are being made of every panel in case panels are damaged during trial or competition racing. 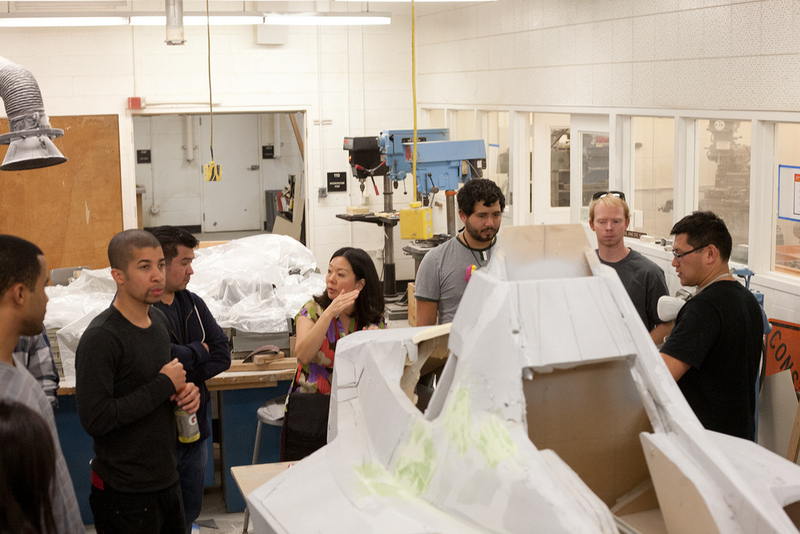 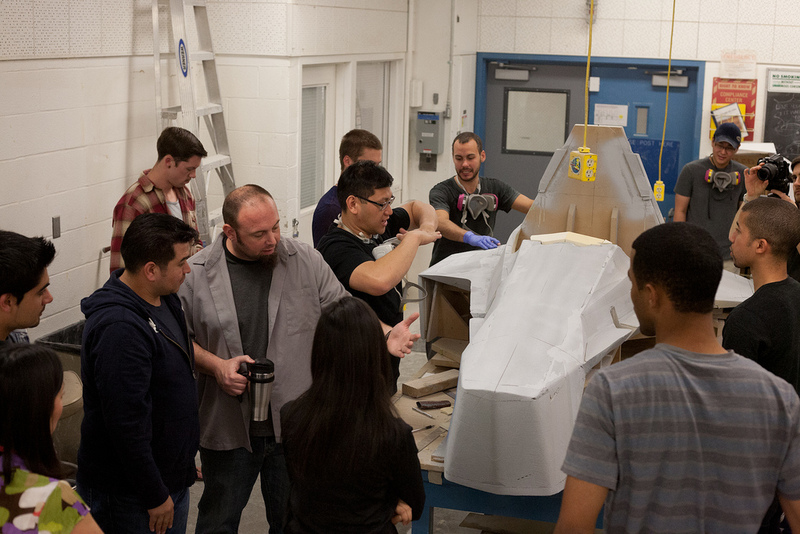 Designers are now reviewing final assembly with SAE engineers and faculty. 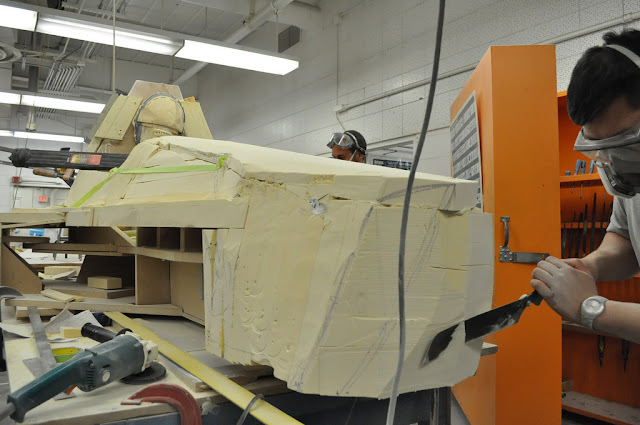 The CNC and clamped mold for the Baja racer's front panel. 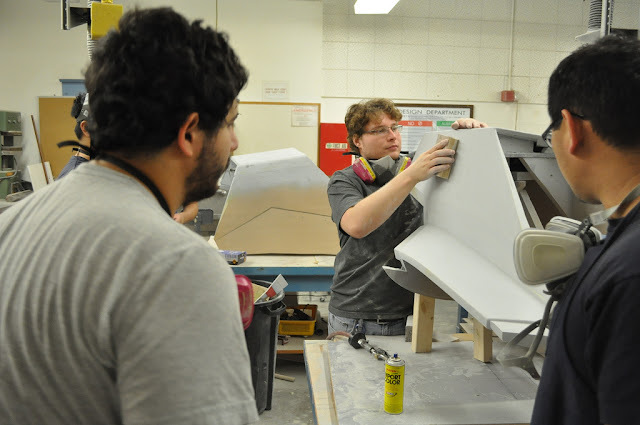 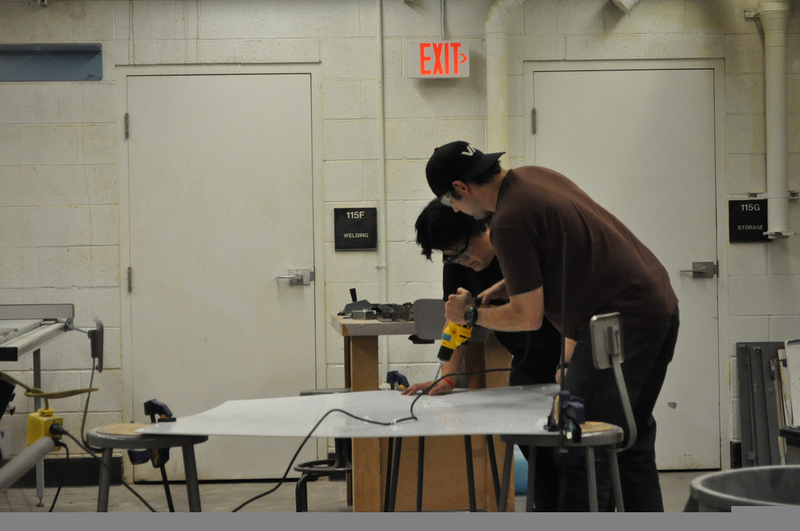 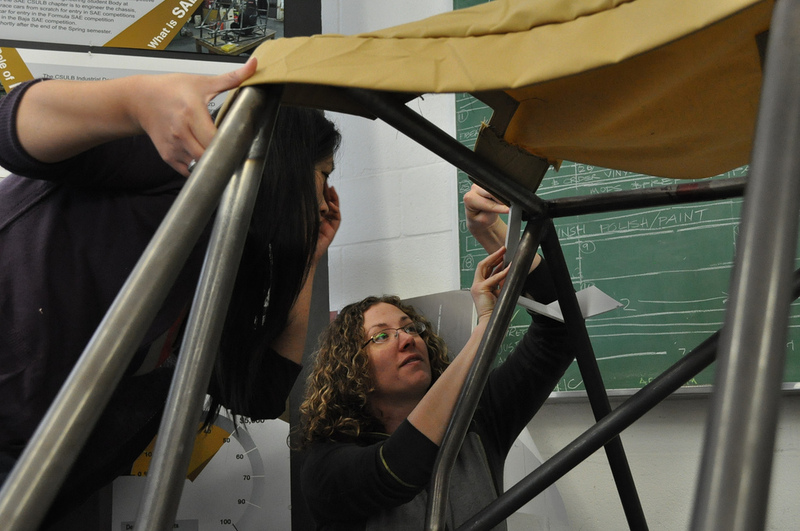 Baja Designers working with engineers and faculty on assembly. 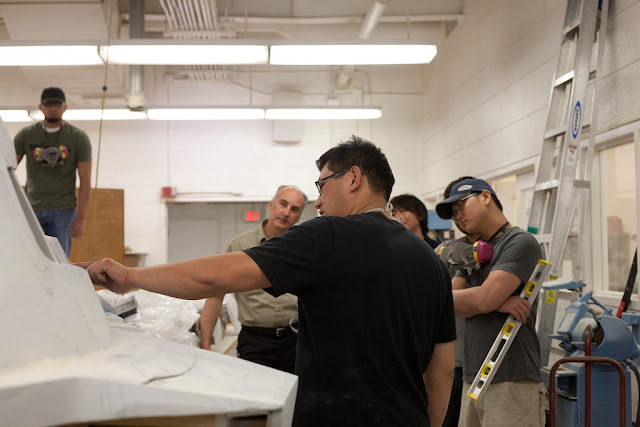 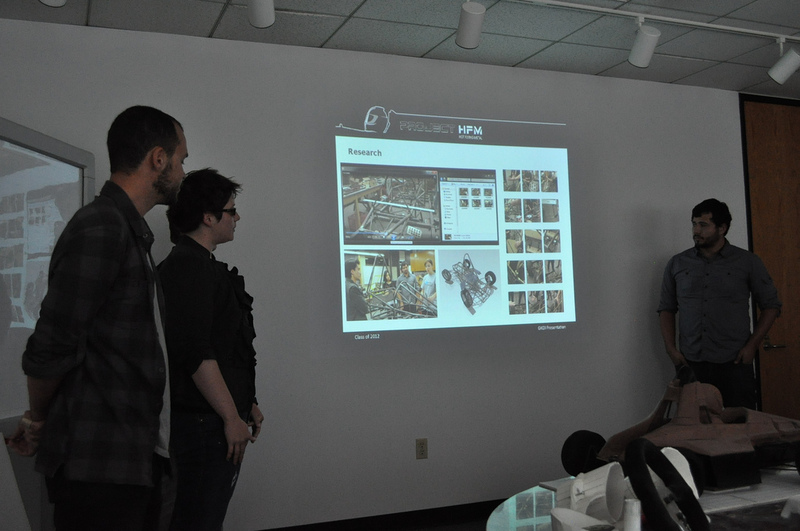 Project HFM Team Managers recently met with class faculty to discuss the design progress at GKDI's studios (Project HFM's platinum sponsor). 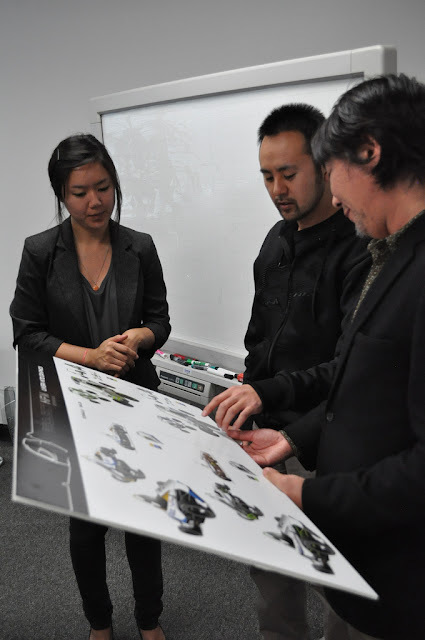 The reception went very well, with formal designs presented, and updates on graphics which are still being refined. 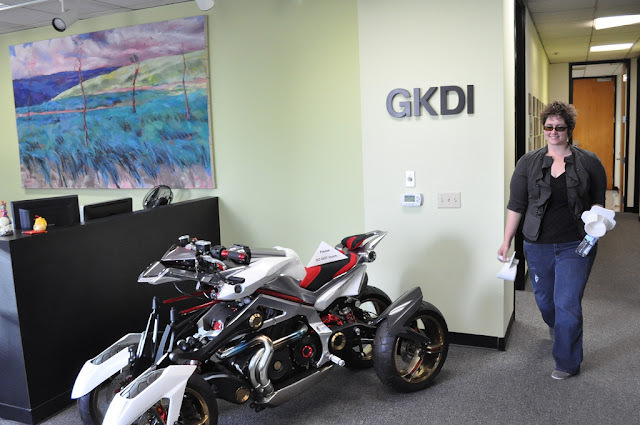 Stella Lee discussing graphics options with GKDI representatives. 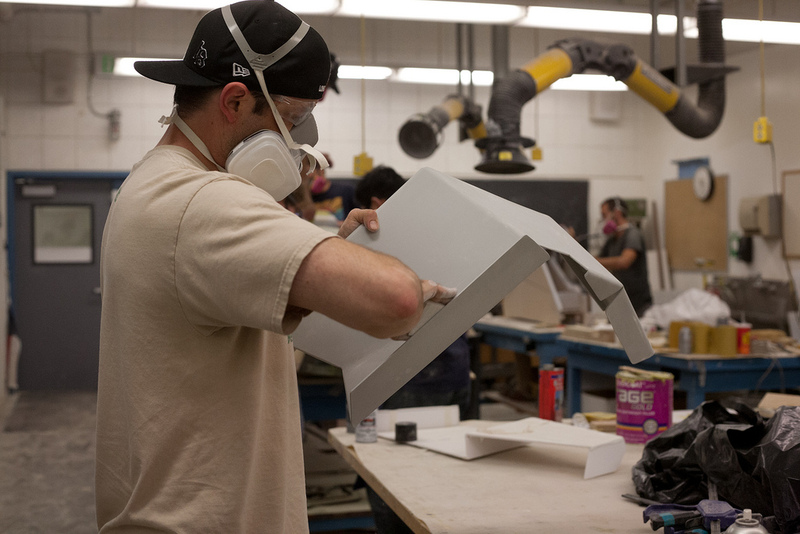 These animated GIFs from week 4 are too good not to share. 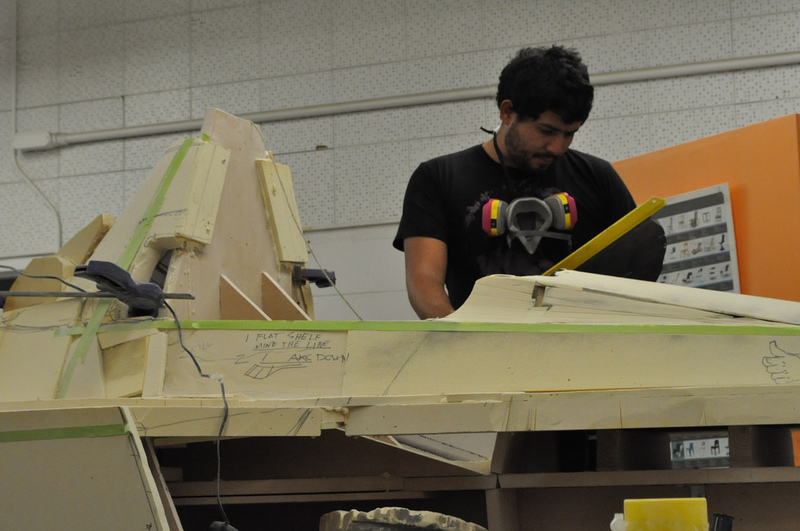 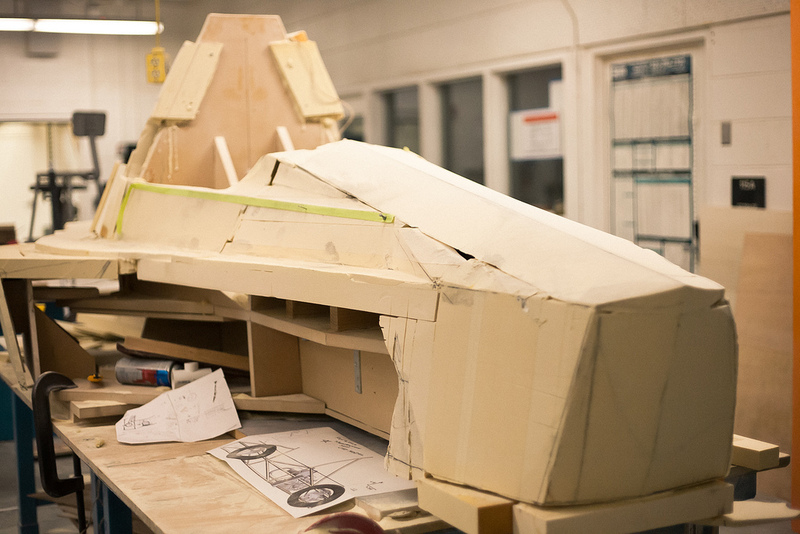 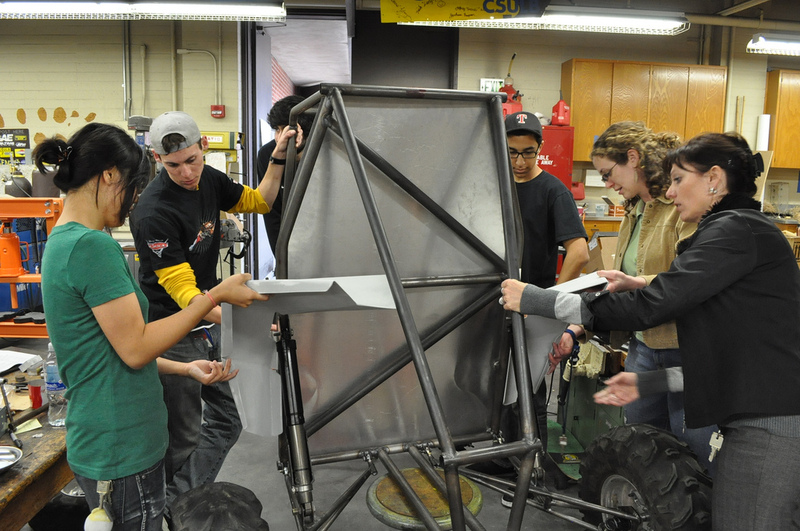 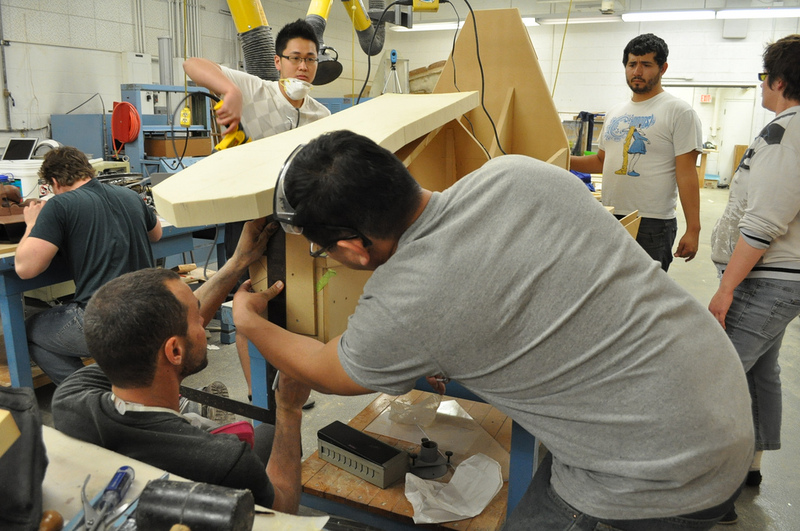 The first shows a member of CSULB SAE practicing egress from the chassis with the formula design mocked up in cardboard. 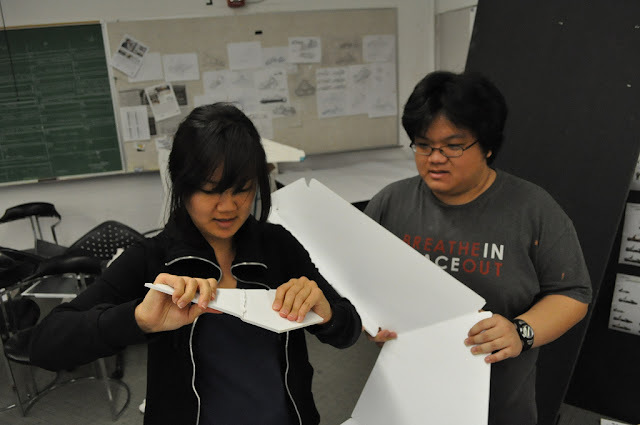 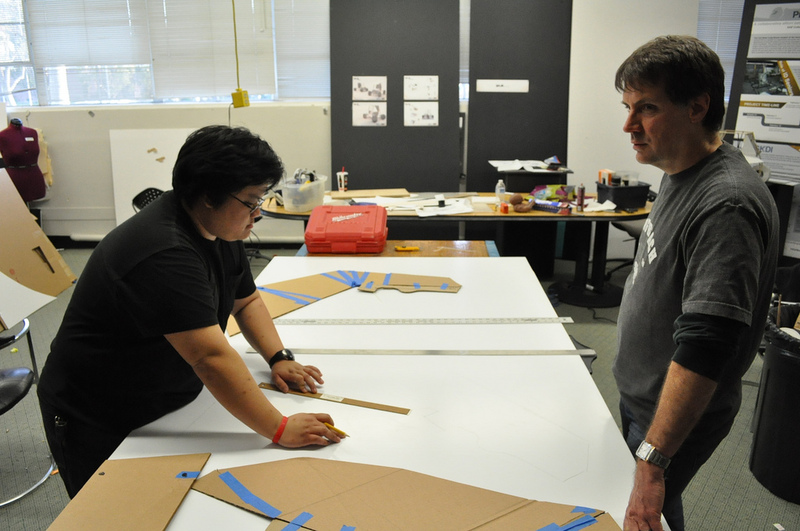 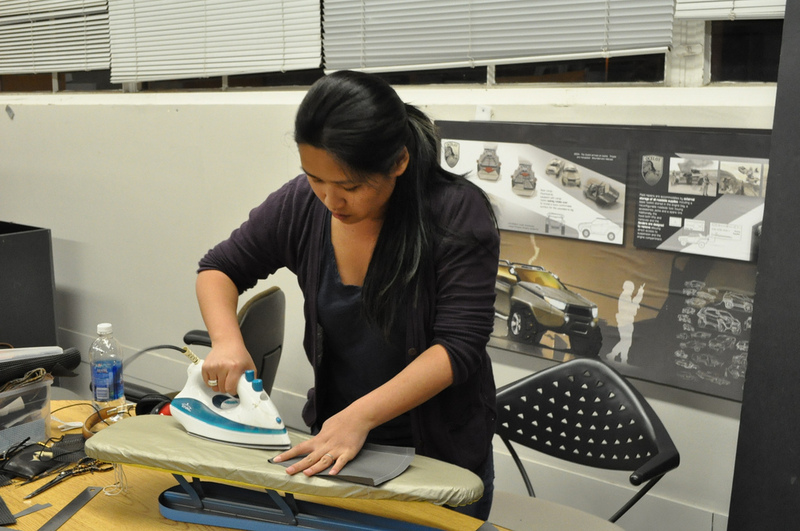 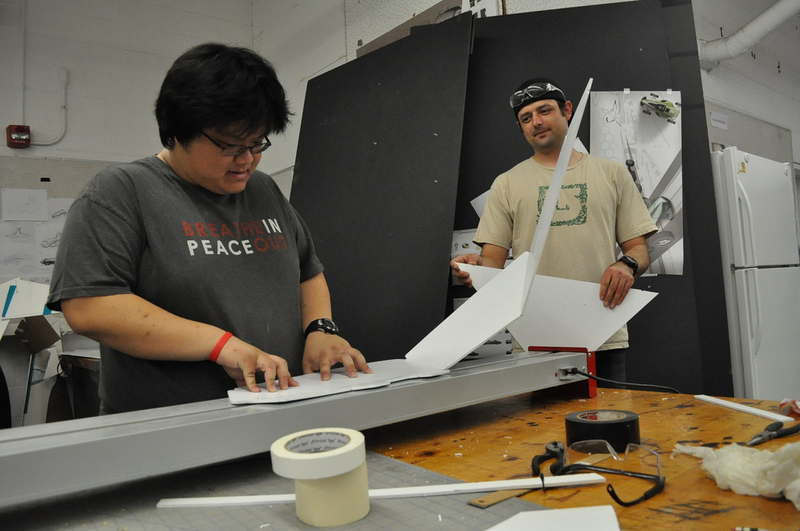 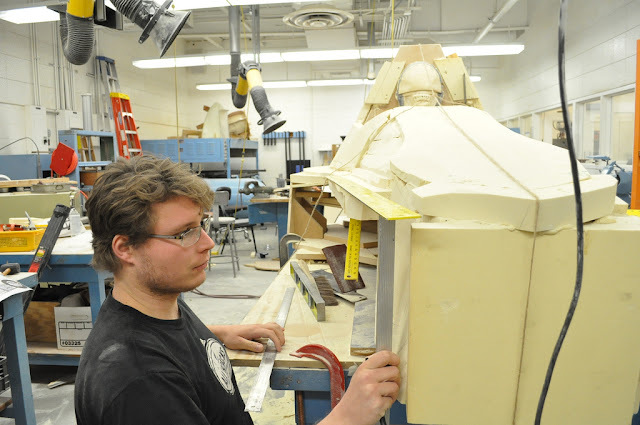 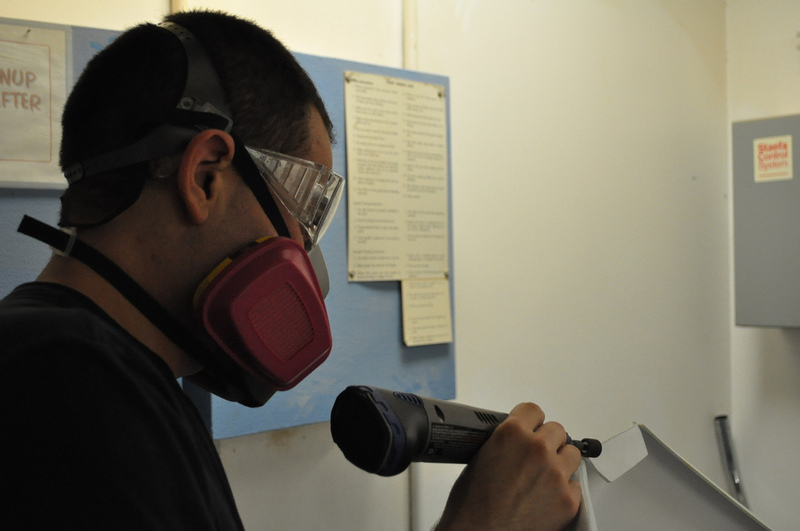 The second is design student Justyn Perzyna finessing details of the 1/4 scale clay model. 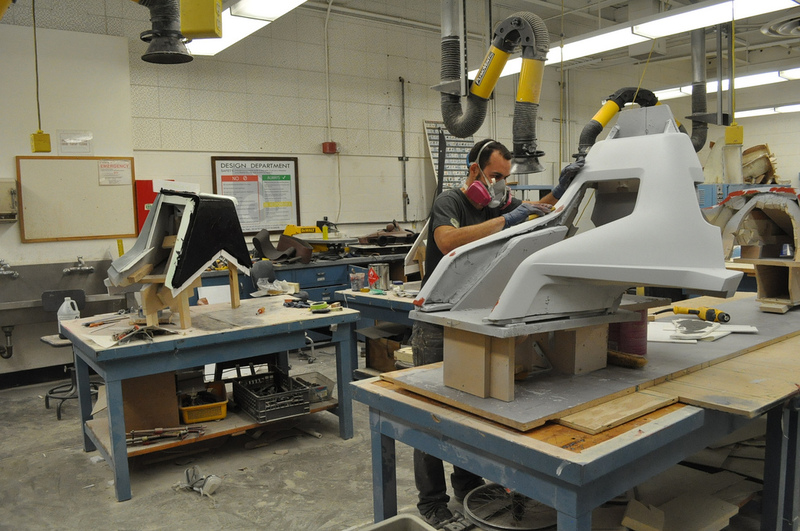 The Off Road lifestyle publication 4 Wheel Drive Magazine features an article on project HFM. 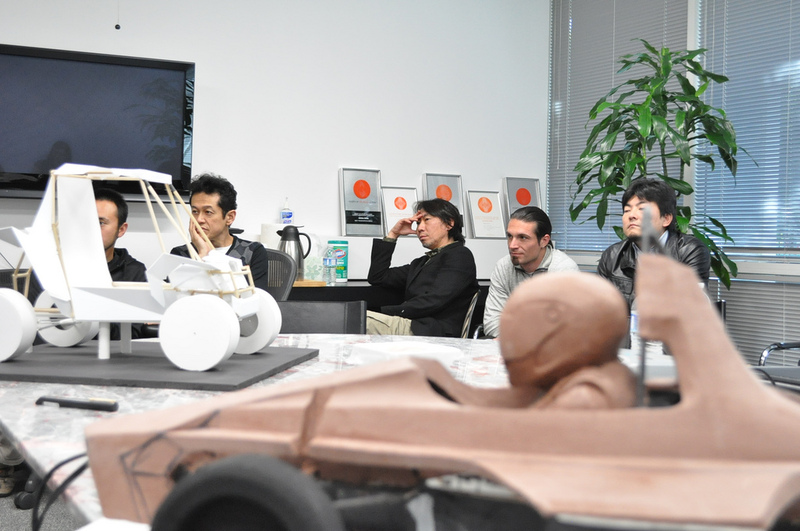 You can read the article on their blog. 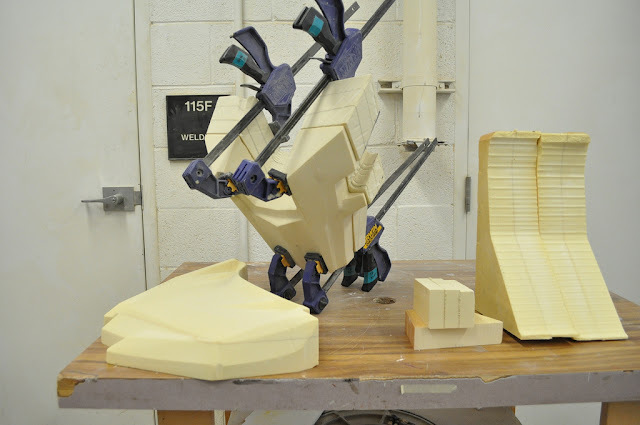 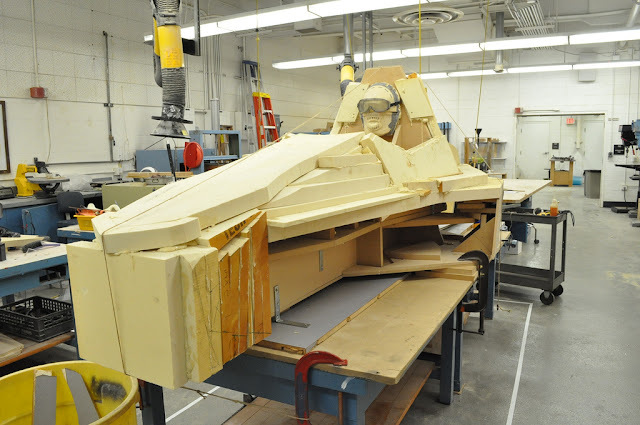 Here is a photo update of the formula foam mold refinement process. Much precision and preparation must be made to achieve equal measurements on both sides. 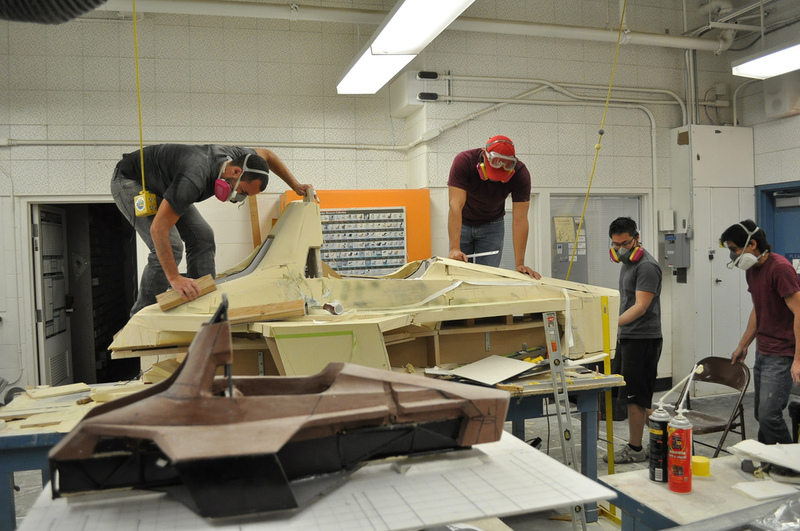 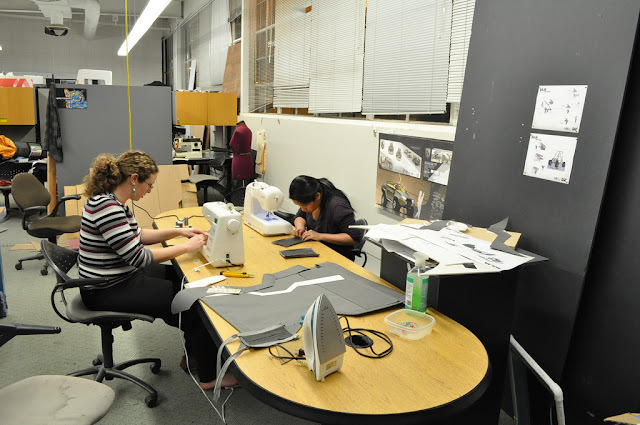 While designers refine the front, other team members are chipping away at the back end of model. 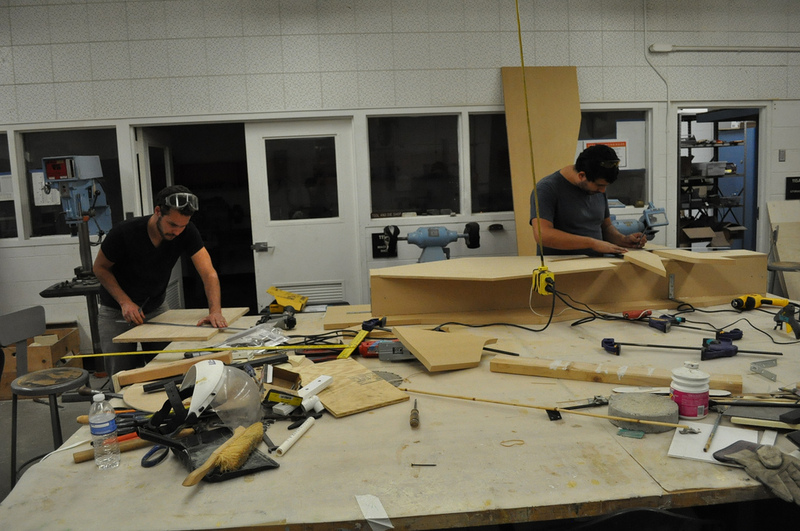 Greg Vanderpol and Vic Promono sanding the sides of the mold-to-be with a focus on symmetry. 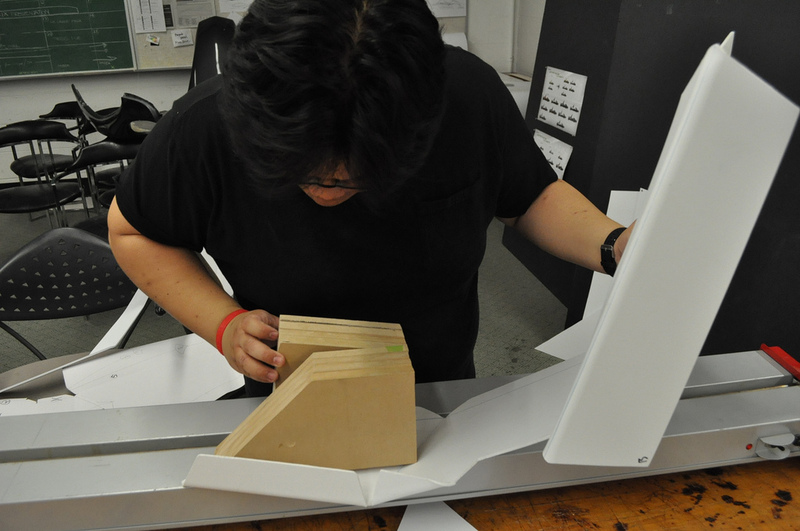 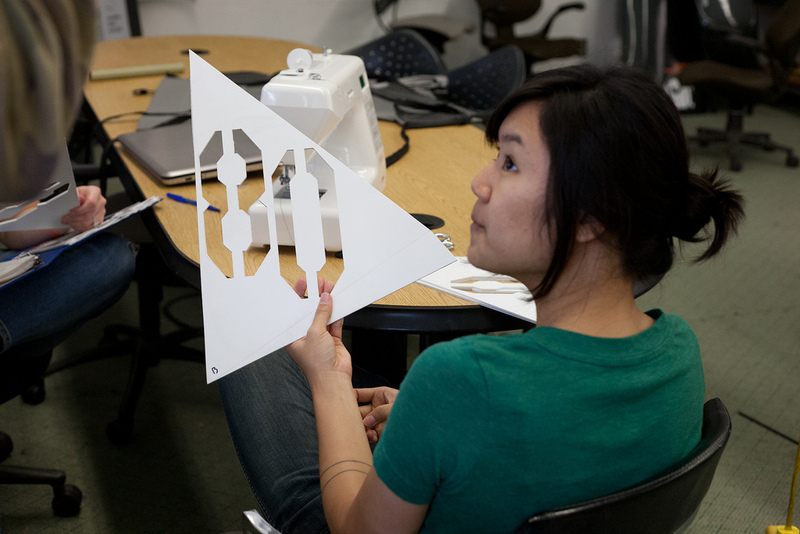 Amber Lundy Sawing excess pieces of foam from the formula mold.